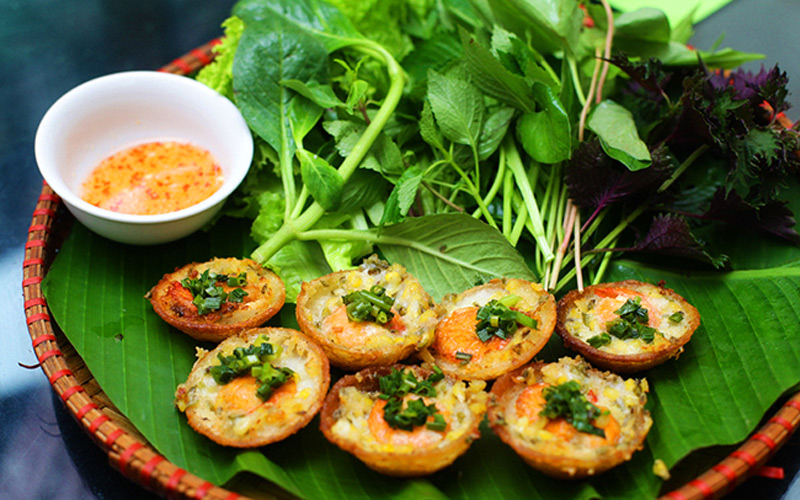 It’s a famous Vietnamese dish of miniature pancakes served with herbs and vegetables and spicy sweet fish sauce for dipping. The batter is made of a combination of mostly rice flour, and even leftover grains of rice, with a hint of turmeric to give them a beautiful yellow tinge, and mixed together with coconut milk to make it extra creamy and rich. Finally, the topping is usually shrimp and diced up green onions, and in this case, extra coconut milk. She allowed the mini griddle pancakes to cook for a few minutes, with the lid on, until they were nearly all the way cooked through, fully crispy golden on the bottom side. Then, she tossed on a sprinkle of fried mung beans (I believe that’s what they were), and finally she artfully placed on a little pre-cooked shrimp, and a sprinkle of sliced green onions to top it off. The shrimp added a protein touch, and the pieces with the extra coconut cream topping, added just a hint of even more richness.